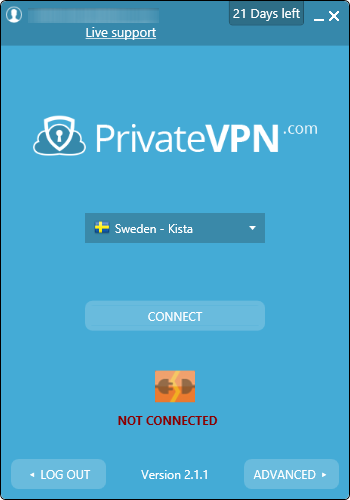 Private is a Swedish VPN founded in 2009. While it’s not one of the leaders on the market, it offers a secure and reliable anonymous VPN connection with notable features. And it provides fast servers in the major countries. So you can use it to unblock geo-restricted content: social media or streaming sites. In addition, you can download torrents with Private VPN without leaving traces. 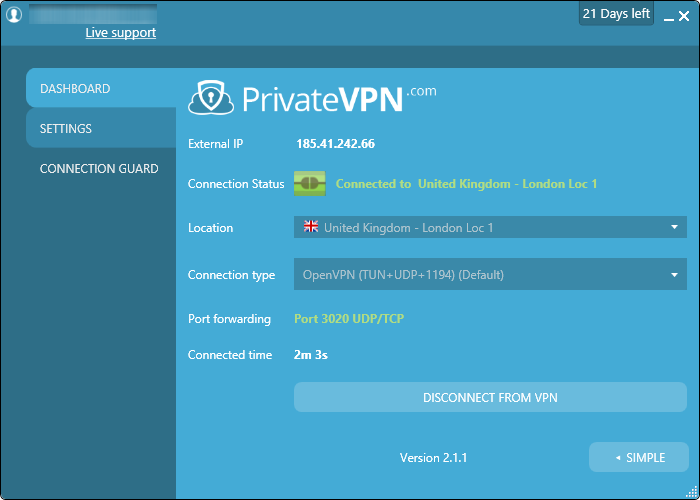 Let’s review PrivateVPN in details now. And enjoy my exclusive PrivateVPN coupon! First of all, a word on Sweden where the company is located. Because Sweden is part of the fourteen eyes countries, an alliance of intelligence operations created by the US and the UK. That’s clearly not a good thing for privacy. With over 80 servers in 52 countries, you can access the most popular restricted websites. Among them : Australia, Canada, United Kingdom and United States. Furthermore, their premium servers allow users to watch streaming videos in HD and to download torrents. There’s only one package including all the features. And you can decide how long you want to subscribe : 1 month, 3 months or 1 year. As you can see on the screenshot above, this VPN from Sweden is very affordable. Indeed, there’s a promotion running with a 25% discount. So you can get a very good price, even for a monthly subscription (same price as ExpressVPN for a yearly subscription – even if the service are not really comparable). Also you should keep in mind that for this price you get up to 6 multi-logins. So you can protect all your devices or share your connection with your family and friends. And if you share your access, you can also share the costs! Furthermore, there are 2 ways to try Private: With their free 1 day trial or with their money back guarantee for 30 days. 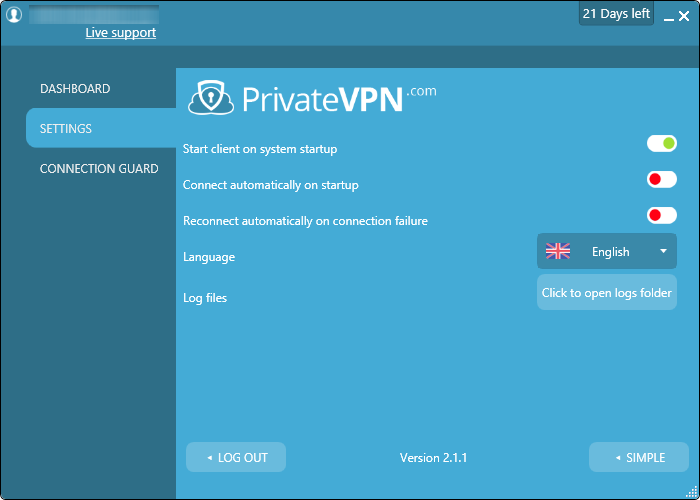 OpenVPN support Supported by SSL-based OpenVPN protocol with 256-bit data encryption. I have reviewed a lot of VPNs. And this is not something that I’ve seen previously. Indeed, most of the time you can get a minimized interface and a complete interface. But Private offers 2 full interfaces. The first one is for casual users with the server selection and the connect button. Simple but efficient. And you feel that’s a real software, not a widget. And if you click on the Advanced button at the bottom right corner of the client, you can access the other interface. On the Dashboard, you can select the server location and the protocol. 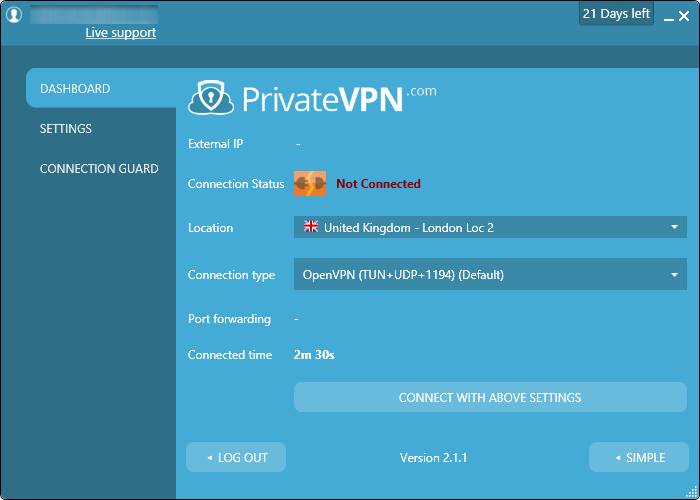 While this VPN offers several protocols, I always recommend OpenVPN which offers the best speed and protection. With this interface you can reach the Settings tab, to tweak the client to your liking. As you’ll see on the screenshot below, the settings are limited. 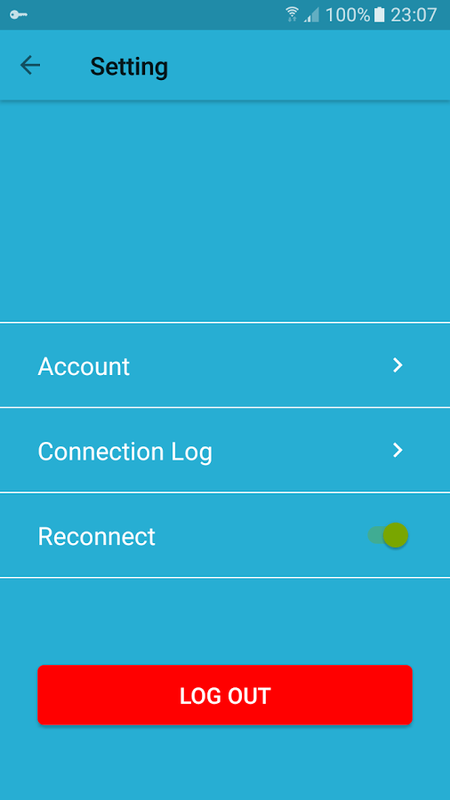 Indeed, there are really 3 options you can enable/disable: Launch client on startup, connect on startup and automatic re-connection. I was curious so I clicked on the language drop down… And there’s only English available! I guess they planned it for the future updates. Finally, on the last tab named Connection Guard, you’ll find the features concerning the protection of your connection. For the best privacy protection, these three features are enabled by default: IPv6 leak protection, DNS leak protection and Kill Switch. Does PrivateVPN work with Netflix? Yes! If you’re looking for a VPN to watch US Netflix while at home or stream UK Neftlix while abroad, this might be the one! Indeed, PrivatVPN promotes a custom-built VPN for Netflix. And they’re not lying! Visit their site to know what VPN servers can unblock Netflix and enjoy your favorite programmes. Does PrivateVPN work with BBC iPlayer? No. I tried both their servers in the UK and none of them gave me access to the BBC content… Therefore, if you want to watch BBC iPlayer abroad, look for another VPN in my article. This VPN provider is torrent-friendly! Furthermore, you can use any of their servers unlike other services. However, I’d recommend to connect to countries which respect users’ privacy, like Sweden. Also, as I said above, this Virtual Private Network provider enforces a strict zero logging policy. So you can really download torrents anonymously. And you shouldn’t download torrents without a Kill Switch! That’s why the feature is included in the client, and even enabled by default. If you don’t know what a Kill Switch is, here’s a quick reminder: It’s a setting that will block all your internet traffic if your VPN connection fails. And this is almost mandatory these days on Windows. Indeed, your OS may reconnect you out of the VPN tunnel. So you would be downloading with your IP address in the clear… Ready for the copyright trolls to log it. 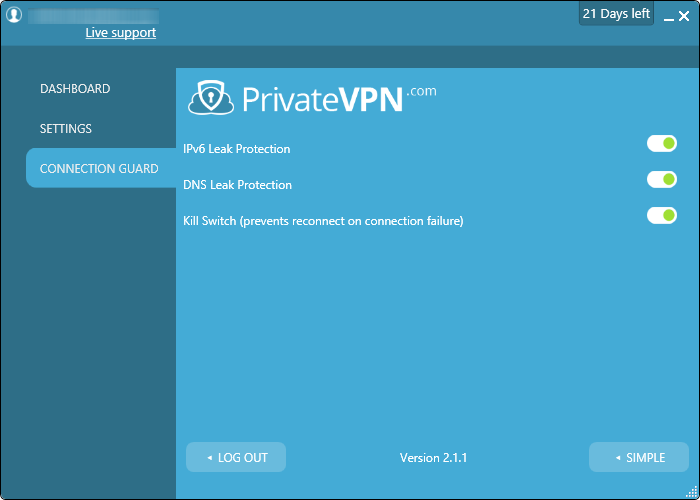 The VPN client offers an efficient protection against DNS leaks, for both IPv4 and IPv6 protocols. So you can be sure all your requests pass through the VPN tunnel. And your privacy is guaranteed. Should you need it, port forwarding is supported. However, you’ll have to check their server list or contact them to know which servers are available and how to set it up. While it’s not really a feature, I have to mention their remote installation service. Indeed, it’s the first VPN provider I know that is offering this service. So if you struggle with the installation, one of their technicians can install the VPN client for you! If you share your connection with less than tech savvy people, like your grand parents for example, it can really be useful. In addition to the Windows software, this 1-click-setup VPN offers applications for the most popular platforms: Mac, Android and iOS. And the designs are very similar, so you’ll easily switch from one to the other. 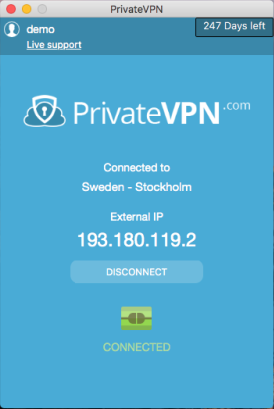 This Swedish VPN provides a premium service that encrypts your connection. Therefore it protects your privacy and increase your security. 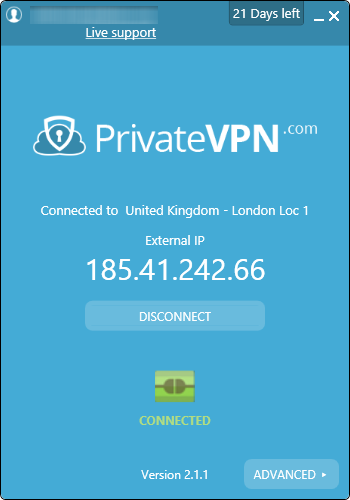 Private is definitely a serious VPN provider with a very good service. It's suitable for all the users who wants to protect their privacy, watch video streaming and download torrents. The plans are very affordable and you can get 6 simultaneous connections, which is better than most.